Get creative! A DIY Halloween is the very best kind. Photo: Organic Haus via Flickr. This essay originally appeared in the launch issue of Transition Voice, the online magazine I edit on peak oil, climate change, and economic crisis. One of my worst parenting memories happened when I took my daughters trick-or-treating on the vaunted Lawn of the University of Virginia campus one year. The girls were little at the time, and the picturesque associations of the annual UVA Halloween tradition conjured up by friends made it sound incomparable to other activities. This was easy: show up around 4:30pm and go by Lawn dorms to collect goodies from UVA’s cream of the crop. Of course the students were generous, each room having a cask of corn syrup-laden goodies to dispense to the pint sized crowd. The Lawn was equally delightful on this particularly gorgeous autumn day. But no matter that the students’ intentions were clearly good, the set up left no room to feel that. Lighting of the Lantern. Original painting by Sheryl Humphrey. The place was a mob scene. Every parent in town had their little Harry Potters, Hannah Montanas, firemen, and princesses out to enjoy the festivities. And why shouldn’t they? After years hearing about the razor blade sickos lurking behind every third suburban door (every other door in the city), parents wanted something they could feel safe about. The trade off, though, sacrificed the magic of encounter. Instead the costumed passels moved along as if in one of those contests where you’ve got ten minutes to stuff your grocery cart before the timer goes off. And the UVA students looked like they were on on that episode of I Love Lucy where she worked at the chocolate factory, repetitively dishing out another fistful of grub just in time to hit the plastic pumpkin and do it all over again—fast, faster, faster!! A similar scene takes place all over the States, only this one is the mastermind of business. In it, kids are invited to either malls or bustling Main Street downtowns to hustle by the storekeepers for treats. Again, the intentions are good—well, sort of, mostly it’s a tactic by development associations to drive business. But the context is lame as all get out. These events invariably happen in the daytime under the premise that it adds to safety (fewer kids struck by cars than under cloak of darkness). But let’s face it, at that point Halloween is nothing but an anonymous zombie candy collecting parade—no heart, no soul, no mystery, no magic. Rather than being in the familiar yet altered realm of the neighborhood (hey, we thought you wanted to get to know your neighbors?) it happens in yet another commercial context, business mediating the landscape of encounter. I just had to have that generator-fed 12 foot blow-up pumpkin! And what’s the other driver of this madness? Store bought junk. Don’t get me wrong, I’m pro business and certainly pro local business, but while Halloween has jumped to nearly $6 billion in annual sales, I’m sad to point out that the lion’s share of this is for extraneous nonsense made cheaply in Chinese factories and shipped across the globe in container ships, spooking the earth with a massive carbon footprint. All this while people at least say that they’re pining for simpler ways, simpler times, more connection, more meaning, more experiences, fewer expenditures. But where’s the accounting? I’m finding more and more that as I say these things, and hear them, that I expect myself to walk my talk and for others to do the same. It’s the only way we’re going to make meaningful changes. Bring mystery back to Halloween. 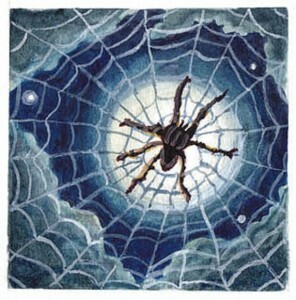 Spider Moon. Original watercolor and gouache painting by Sheryl Humphrey. And while I’m grousing here, let me add that the whole store-bought costume thing is such a crock! Hey, I’m not anti fun, but my gosh, what ever happened to the good old fashioned homemade Halloween? When I was a kid we had to walk five miles through a blizzard to get to school. I mean, when I was a kid, we generally figured out our costume on Halloween night (or if it was complicated, we spent the month ahead fashioning it from cardboard, twine and the rag bin). Basically the hobo, gypsy, ballerina, and cowboy ruled the day because they were so easy to throw together. Guessing what people were was half the fun. One year I wore all pink and pinned the word Floyd to my chest. Another I wore my dad’s brown robe, painted on a moustache, pulled my hair into a top knot and went as a samurai. Homemade Halloweens have already gone mainstream with home arts revivalists such as Martha Stewart. Now, Martha is not the queen of renunciation or anything, and she has a huge empire. But let’s face it, she’s done so much for encouraging people to recycle what they’ve got, and to be inventive. She’s promoted being DIY in earnest. And the lady’s crazy for Halloween, offering inspiration on the cheap through her Website. She makes it easy to think up and try making costumes at home, which are exactly the costumes you’ll love best when browsing your pictures ten years after the kids have flown the coop. I recall another Halloween when I took my daughters at an even younger age to Charlottesville’s Downtown Mall for a sponsored Halloween event with costume contests. I spent a few days making my older daughter a rag-tag princess costume, all hand sewn from scraps of my vintage fabric collection but by no means haute couture (I didn’t use a pattern, just winged it). My younger daughter, about two at the time, I put into an all over jammy, pulled striped bloomers over her bum, and put goggles and a swim cap on her making her an old-school swimmer. Totally cute. But the costume award was given to a lovely child dressed in a Tinkerbell costume from The Disney Store! Now, I’m not just griping because my kid didn’t win. I’m griping because, WHAT? You buy a costume off a rack and win the contest? That’s like the contest for having the least imagination. Glad we lost. Okay, memory lane aside, and the risk of sounding like a stick in the mud acknowledged, my point is that each one of these occasions for Americans to pony up to the cheap China export trough offers another chance to ignore your carbon footprint, and divert your hard earned money from your pocket to huge corporations who, more times than not, offer low wages to both their manufacturers abroad and their service workers at home. Sure, you may be sending some cash to your local tax coffers, but you could do the same buying tidbits from the thrift store (recycled=smaller carbon footprint) and cobbling them together yourself or letting your kid do so. More better if the thrift store is local instead of a chain. The Little Witch. Painting/Photo: Sheryl Humphrey. Same goes for the extraneous decor and increasingly ostentatious Halloween supplies available to turn your house into a cartoon for a month or a week. This is fossil fuel intensive excess that we can ill afford in a world at peak everything . Heavens, I’m not writing a screed here against celebrations, fun, holidays, enjoyment, sharing good times or any of that delightful stuff. But what I am saying is that to really begin the level of conservation that is necessary as a personal response against hyper resource use and in favor of a relocalized economy, we have to begin now, questioning every little thing we do, everything we buy, and every way we devote our personal resources to a certain lifestyle. Moreover, stepping down from the fossil fuel economy happens best when you replace consumption with experiences — most of all, ones you create yourself. Have fun making the costumes, letting your on-hand resource limitations define the perimeters of innovation. Massage your creative muscles. Weave some magic! If for milennia pockets of humanity have fashioned All’s Hallow Eve celebrations through the simple rituals of carving a turnip or pumpkin, lighting it, brewing a batch of mulled cider, and warding off threatened pranks with a treat buy-off, there’s got to be some fun to be had in those simple time-honored traditions. Trick-or-treating is made more fun for being simple: a block or two of houses and then home again for caramel popcorn or apples. Let the holiday be an opportunity to plan a feast, bake together, set the scene, and then indulge in some shadow plays, ghost stories, and inventive tricks. Honor the dead whose memory is resurrected on the morrow’s All Saints and All Souls’ Days. Make Day of the Dead dioramas with older kids and adults from shoe boxes and display your works on the mantle. Gather friends, have fun, and do it with what’s on hand. It really is time to shift away from seeming corporate imperatives, unconscious spending, and habitual consumption. If we’re going to change course on this life and culture it has to begin somewhere. The alternative is too scary.